Everyone has replaced their rear leg walker tips with tennis balls. You can do even better with walker glides that look like tennis shoes. The sneaker walker glides add a sense of whimsy to your life. The sneaker walker glides will allow you to glide easily and smoothly over most surfaces. 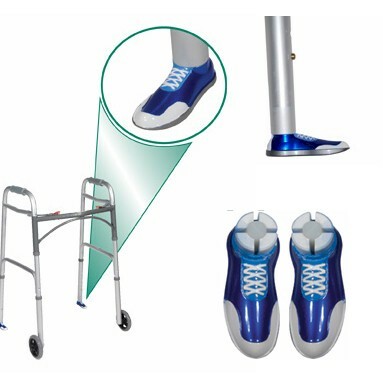 The walker glides are made of a dense, durable plastic that ensures long life. The glides are easily installed on your walker. The walker glides are 3.75 inches long x 1.25 inches wide. They are available in blue and white.